A fascinating 2-1/2 hour narrated tour of Cape Ann's scenic coastline, aboard the King Eider. 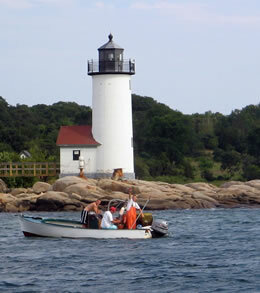 Up-close views of six lighthouses, fishing and lobstering fleets, and the Annisquam River. 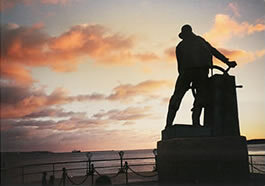 On this 1-1/4 hour tour and demonstration, you'll learn all about lobsters and lobstering aboard the King Eider. You'll also enjoy a narrated tour of historic Gloucester Harbor, including the fishing fleet, Ten Pound Island, Rocky Neck Art Colony, Norman's Woe and much more. On this leisurely journey, you will cruise along and view the barrier beaches, clam flats and tidal tributaries. Take in the unique waterscapes and experience first-hand a widely recognized Important Bird Area (IBA) featuring Herons, Egrets, Cormorants, Sandpipers, and Gulls. On this 1-hour narrated tour, your day-long pass allows you to get on and off the vessel to explore different locations within Gloucester's inner harbor. Regular stops include Harbor Loop/Jacob's Landing, Saint Peter's Town Landing, and Rocky Neck (The Studio Restaurant dock). Limited Seasonal Passes for on sale now. Welcome to Cape Ann's longest running boat tour company, featuring the exclusive Lighthouse Cruise -- the ONLY tour that completely circles Cape Ann! Enjoy your cruises aboard our USCG-certified motor vessels, King Eider and Lady Jillian. Our tours fill up quickly -- advance ticket purchases are recommended! For same-day bookings, please call (978)283-1979. Tour gift certificates are also available.